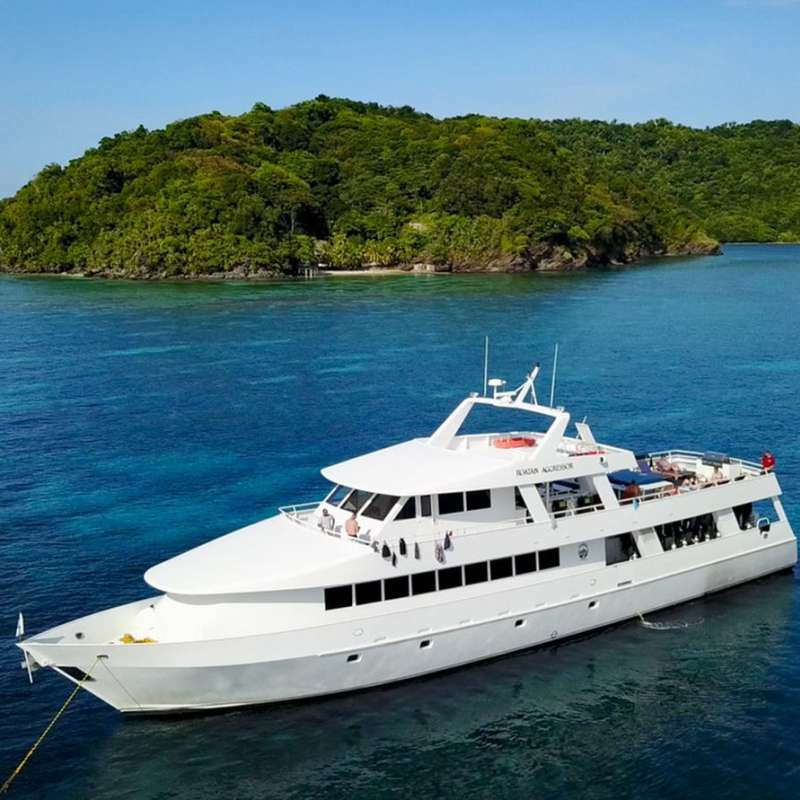 Every Saturday at 6 pm, the luxurious BELIZE AGGRESSORs casts off from the Radisson Ft. George dock for liveaboard scuba diving, located in the heart of downtown Belize City for a week of hassle-free diving to Lighthouse Reef, Half Moon Cay and the famous Blue Hole. The mystical Blue Hole, a collapsed freshwater cave system is approximately 1000 feet across and over 400 feet deep. The Blue Hole was made famous by ocean pioneer Jacques-Yves Cousteau who declared it one of the Top Ten Dive Sites in the World. In 1971, he brought his ship, the Calypso, to the Blue Hole to chart its depths. Once descended into the Blue Hole guests will see beautiful vertical stalactite formations. 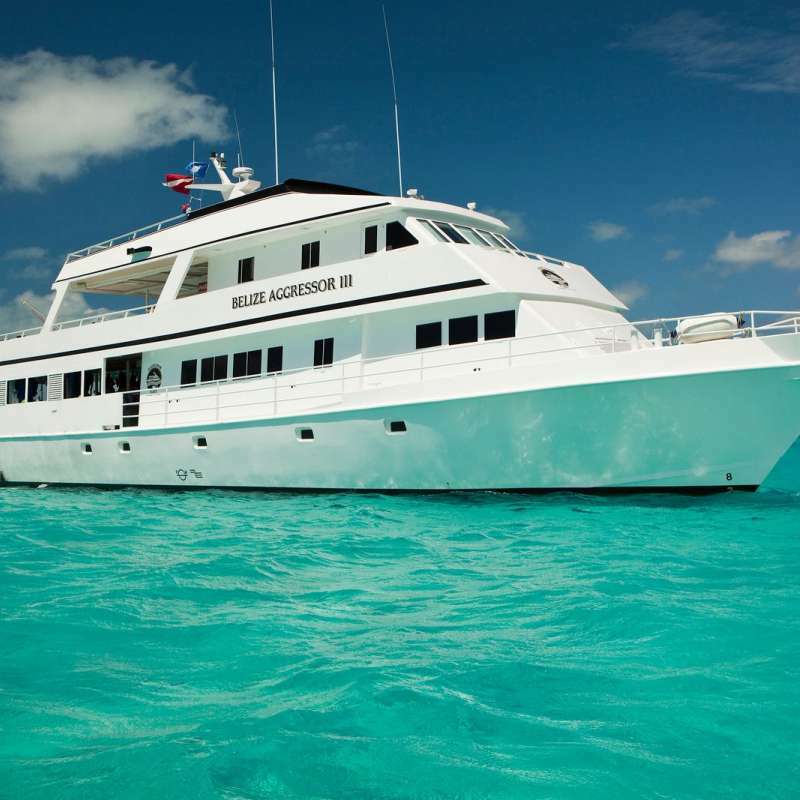 Throughout the week you will dive at Turneffe and Lighthouse Reef. Sheer walls like Painted Wall, Half Moon Caye Wall and Quebrada are adorned with huge crimson gorgonians and wandering, lilac rope sponges. Weather permitting; divers explore the mystical Blue Hole, a collapsed freshwater cave system. With all dives from the mother ship, up to five dives a day are offered except on Friday. Diving begins Sunday morning and ends Friday before lunch when the yachts return to port. The crew hosts a sunset cocktail party at 5:30 p.m. followed by dinner shore (not included). Saturday morning at 8:00 am, guests are transferred to the Belize Airport or a local hotel. Throughout the week there will be opportunities to go ashore for swimming, snorkeling and beach combing. The Belize Aggressor III and Belize Aggressor IV operate out of Belize City, Central America. Guests arriving in Belize on Saturday are greeted at the international airport by a crewmember in uniform who will have a “Belize Aggressor III and Belize Aggressor IV” sign when guests exit outside of the airport. (transfers are not provided from the Belize City Municipal Airport). The yacht agent cannot enter Customs but will be just outside at the international arrivals area. Baggage handlers may aggressively offer to help with your luggage those few feet for a mandated per bag fee. If you are already in Belize, please make your way to the Radisson Fort George Hotel any time before 3 pm. Both yachts dock or anchor at the Radisson Fort George Hotel Dock and depart for the week after everyone is onboard Saturday evening. Airport Arrival into Belize: There are two complimentary transfers provided by the Belize Aggressor III and Belize Aggressor IV from the airport to Belize City at approximately 12 pm and 4:30 pm which may vary based on the flight arrival times. Most flights arrive around the same time. Guests may have to wait up to one hour for the shuttle; however, they may wait in the airport lounge which has free wi-fi. If guests prefer not to wait, they may take a taxi for approximately $25 to the Radisson Fort George Hotel and wait until boarding time. Guests may board the boat starting at 3 pm and all guests must be onboard by 6 pm. At the end of the week, there will be two complimentary shuttles to the airport at approximately 8:00 am and 12:00 pm. Guests departing earlier or later, may use the Radisson Fort George Hotel facilities and take a taxi from there. Période: les croisières plongées sont possible toute l'année. La haute saison est de novembre à avril. Les visas: la plupart des nationalités sont tenues d'obtenir un visa avant l'arrivée aux ambassades du Belize ou consulat britannique de votre pays. -Le visa n'est pas requis pour les citoyens des États-Unis et ses territoires, Canada, Royaume-Uni et ses territoires, l'Union européenne, les Caraïbes et les pays d'Amérique centrale. Climat: La saison sèche de Belize est entre février et mai où il connaît une pluviométrie beaucoup plus bas que le reste de l'année. Juin à décembre est la saison des pluies. Eau: La température de l'eau est de 27° tout au long de la saison estivale et redescend jusqu'à 25 ° en hiver. Vêtements: Les vêtements légers sont recommandés durant toute l'année. Vols: il existe bon nombre d'avions et vols quotidiens depuis de nombreuses villes en Amérique du Nord arrivant directement à Phillip Goldson International Airport (PGIA) dans Ladyville, à quelques minutes de Belize City. Devises: la monnaie locale est le dollar de Belize (BZ$), le taux de change fixe est de BZ 2 $ = 1$ US. Les cartes de crédit et chèques de voyages sont acceptées dans tout le pays. Les distributeurs automatiques de billets sont également largement disponibles.